The past two nights I set 5 places at the dinner table and I could not have been more grateful or HAPPY. All three of my kids are home, and although it will be a short time that we’re all together, I’ll take what I can get! I am going to pull back a little from social media and lengthy blogposts in the very short term, so bear with me. I have to walk the talk and enjoy some balance in my life. So I am going to spend some more time with my kids over the next week or so. And then I have to get cracking on several projects which I have mentioned in a previous post. It’s all super exciting, but something’s gotta give! 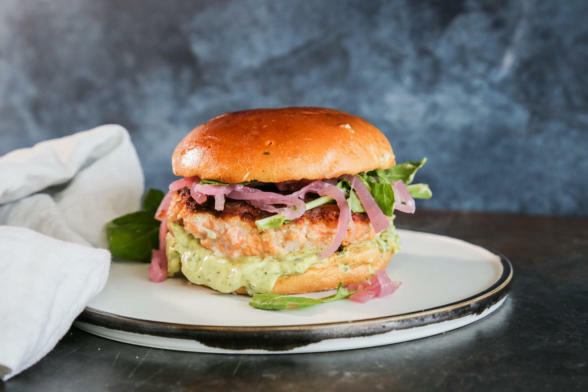 I posted a tease of this salmon burger on Instagram a few weeks ago and I know many of you are excited about this recipe. It really came as a response to one of my students asking me how to get her kids to like wild salmon. Ah, yes. Wild salmon is the only salmon I buy and I don’t bother with any kind of farm-raised salmon, even the fancy ones from Scotland. I want Omega-3 fats and antioxidants, not pro-inflammatory fats and food coloring. Plus, fish farms are destroying the aquaculture and I am not going to use my dollars to support that. But wild salmon has a stronger flavor, more salmony, than farm-raised which has more fat and oil and is definitely blander. Wild salmon is also easier to dry out which is a bummer. In my cookbook, there is a two-page spread on “How to Cook Wild Salmon 7 Ways.” Definitely check that out if you’ve ever come back from the market with wild salmon and no plan. 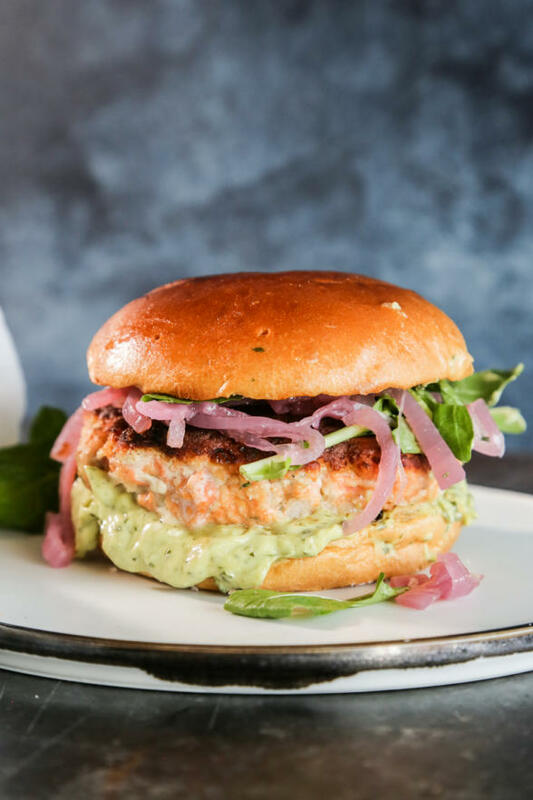 I immediately suggested a salmon burger to this mom because you can really doctor up the fish with lots of great flavors and kids love burgers! Set out a topping bar and you’re halfway there. The technique here may be a little scary because you have to make a paste with some of the salmon and a few ingredients, but go with it and have faith. This is how the salmon gets bound together and turns into a moist burger. These are different from the salmon patties on my site which are made with canned salmon. Those are fabulous and you should give them a try, but they’re much thinner and not burger-like. I like topping my burger with avocado blended with cilantro and lime, plus some pickled onions (how to quick pickle onions in the roasted broccoli recipe in my cookbook) and arugula or in a big lettuce leaf instead of a bun. Basic avocado slices + chipotle Vegenaise + caramelized onions are always a favorite. Or do what my picky son does and eat it plain with nothing on it and touching nothing else on his plate. I am just grateful and happy he’s eating wild salmon. Cut three-quarters of the salmon (just eyeball it) into ¼-inch pieces. Put in a large bowl. Cut the rest of the salmon into chunks; transfer the chunks to a food processor along with the mustard, egg, lemon zest, lemon juice and cayenne. Pulse to make a paste. 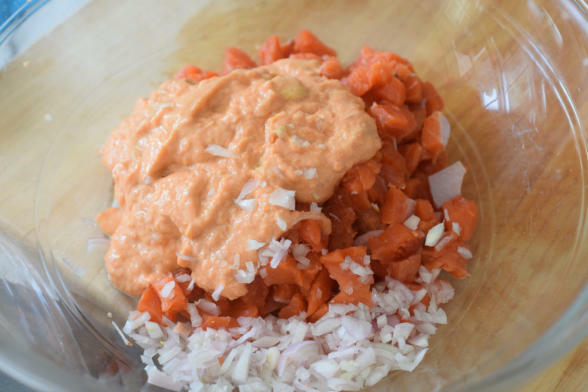 Add the salmon paste mixture to the bowl with the diced salmon. Add the minced shallot, panko, parsley, salt, and black pepper to taste. Gently mix until just combined. The mixture will seem like a sloppy mess. Line a platter or a baking sheet with parchment paper or wax paper. Divide the salmon mixture into 4 mounds on the parchment paper (if you started with 1¼ pounds of salmon, you can probably squeeze out 5 patties.) Form into 4-inch-wide, ¾-inch-thick patties. Cover and refrigerate at least 30 minutes, up to 12 hours ahead. This step helps bind the burgers. Heat the oil in a large non-stick or cast-iron skillet over medium-high heat or 375 degrees on a griddle. Add the patties (in batches if necessary) and cook until browned on the bottom, about 4-5 minutes, adjusting the heat if necessary. Turn and cook until the other side is browned and the patties feel springy in the center, 4-5 minutes. Serve immediately with desired accompaniments. Hi Pamela, is there any way to make these without the eggs? We’ve been planning these for our July 4th grill and I just saw the egg. Use a tablespoon or 2 of vegan mayo! Happy 4th! These were amazing!!! I used wild king salmon (with soy-free veganaise instead of egg) served on Macrina baguette with vegan green goddess dressing from the Vedge cookbook. These have quickly become a summer staple. Thank you for another fantastic recipe (and your quick response)!!! Love when that happens! Good job, Christy! Hi. Have you ever heard that the depletion of the wild salmon population is the number one reason why orcas are becoming endangered? Agreed that fish farms are bad, period. But eating species directly linked to the possible extinction of one of the most amazing animal on Earth is not a good idea, either, no matter how good it tastes. National Geographic ran an interesting piece about this: http://bit.ly/2MyLP1J. There’s a good reason why sensible people do not eat panda bears or rhinos, no matter how good they may taste. Wow I’d never heard this! Thanks for sharing this is sad. Looks great! How do you prepare the garlic aioli? I just took soy-free Vegenaise and blended it with some avocado and lime. If you wanted a garlic aioli, just take your favorite mayo and blend it with roasted garlic.